The Rhine River Valley is a true world treasure, recognized as a UNESCO World Cultural Heritage Site. Explore the region by rail or drift along the river by boat, taking in its many charming, historic, picturesque villages along the way. Experience the best of German food, history, and culture in this gorgeous region. Stay in a vacation rental apartment in a charming Rhine village. Day trip options: Ruedesheim, Koblenz, Bingen, Mainz, Braubach, the villages and vineyards of Mosel, Heidelberg, Cologne, and more! 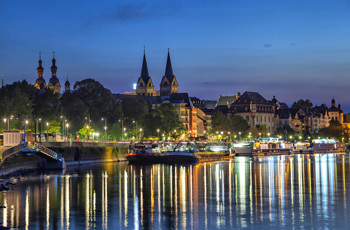 Day trips: Sail, bike or take the train down the Rhine to the charming medieval towns of Ruedesheim, Koblenz, Bingen or Mainz (where you can see the Marc Chagall stained glass windows in St. Stephan’s Church, or visit the Gutenberg Museum). Another day, go up the Rhine to wander the medieval town of Braubach, or roam the storybook villages of the Mosel with their vineyards, cobbled lanes and world-famous wines. For slightly longer day trips, visit the Roman city of Trier, the university town of Heidelberg or the unforgettable cathedral at Cologne. Sightseeing: Visit any one of 30 castles within a 50-mile stretch of your home. In July, attend the Rhine in Flames festivals where spectacular fireworks make the river look like it’s ablaze. In the fall, join in the fun of the countless local wine festivals of this unique wine-producing region. For off-the-beaten-track activities that can’t be beat: Rent bikes and take a journey from one town to the next on flat, well-maintained bike trails that connect villages. Relax on a quiet bench watching the movement of the mighty Rhine. Have your breakfast or lunch on the KD boat (included in your train pass) while admiring the centuries-old vineyards that line the hillsides of this beautiful, bustling river or take the chair lift over the endless vineyards for a tremendous view of the Rhine Valley.